When you begin treating a wart be aware that depending on the size and type it is, it can take weeks to get rid of – sometimes months. If you experience progress with a treatment, keep at it and be patient. Plenty of times a wart will just disappear on its own (as your body builds up immunity against the virus). You can read the most common natural remedies below. The natural remedy we most recommend is H-Warts. Before applying a remedy, wash wart area clean with soap and water then pat dry with a clean towel. Also wash hands with soap and water before handling remedy and touching the wart. Wash hands again after applying treatment to prevent further infection. 1. Apple Cider Vinegar: Saturate a cotton ball with apple cider vinegar (ACV) and apply to wart, secure in place with a band-aid or tape. Do this every night before bed, remove in the morning. Good for all warts, recommended especially for Plantar and flat warts. 2. White Household Vinegar & Baking Soda: Sprinkle a heavy coat of baking soda on the wart then drizzle vinegar over it. Do this once in the morning and once at night until wart is gone. 3. Band-aids Or Tape: Known as the duct tape treatment, keep the wart wrapped tight in tape (without cutting off circulation) 24/7 until it disappears. Band-aids, duct tape, packing tape and scotch tape will all work with the same results. Change the tape daily. 4. Baking Soda: Make a thick paste of baking soda and water, apply to wart and cover with tape or a band-aid. 5. Clear Nail Polish: Paint the wart with a coat of clear nail polish, reapply as needed until wart is gone. 6. Hydrogen Peroxide: Apply to wart each day using a cotton swab. 7. Toothpaste: Dab regular toothpaste generously on top of the wart then cover with a band-aid. Do this daily until wart is gone. 8. Aspirin: Rub wart with olive oil then place an aspirin tablet on top and secure with a piece of tape or band-aid. Change daily. Or crush an aspirin tablet fine then add a few drops of water to make a paste. Apply to wart and cover with a band-aid. Watch on sensitive skin. 9. Vitamin C Tablet: Crush the Vitamin C tablet fine then make a paste with water. Apply to wart and wrap it with tape or a band-aid to secure. Change daily. 10. Wart Control: Wart Control is a natural product containing carefully selected essential oils and homeopathic ingredients that aids in the treatment of warts. Learn more about Wart Control. 1. Potatoes: Cut a potato in half and rub the potato juice over the wart. 2. Lemons: Rub a slice of lemon over the wart for 5 minutes twice a day. You can also dab lemon juice directly on the wart. 3. Limes: Rub a slice of freshly cut lime over the wart for 5 minutes twice a day. You can also dab lime juice directly on the wart. 4. Bananas: Cut a piece of banana skin just bigger than the size of the wart. Place the peel white side down on top of the wart then cover with tape or a band-aid to hold in place. Replace daily until wart is gone. You can also rub the wart with a fresh slice of banana. 5. Eggplant: Cut a thin slice of eggplant just a bit larger than the wart and hold in place with a piece of tape or band-aid. Change daily until wart has disappeared. Good remedy for children or those with sensitive skin. 6. Onion: Rub a slice of freshly cut onion over the wart twice a day. Can also sprinkle onion slice with salt first then apply to wart. Another suggested treatment is to drizzle lemon juice on the wart then cover with a freshly cut piece of onion (wrap a piece of tape or band-aid around to hold in place). 7. Carrots: Grate a fresh carrot then mix with olive oil until you have a thick paste. Apply to wart and cover with a band-aid. Do this twice a day until wart disappears. 8. Apples: Apply a freshly cut slice of apple to the wart and secure in place with tape or a band-aid. Change twice a day until wart is gone. 9. Garlic: A few variations of this treatment: Crush garlic then cover the wart completely with the garlic, wrap tape or a band-aid to secure in place. Do this every night before bed. Apply the juice of garlic to the wart twice a day. Each night at bedtime apply a slice of garlic to the wart, wrap with a bandage. 10. Figs: Mix mashed fig with a bit of olive oil and apply to wart, cover with a band-aid. Do this daily until wart is gone. 11. Radishes: Cut a slice of radish just the size of the wart, cover the wart and secure in place with a band-aid. Change daily. 12. Pineapple: Apply a freshly cut piece of pineapple to the wart morning, noon and night until wart is gone. 1. Witch Hazel: Rub Witch Hazel into the wart a couple times a day. 2. Clove Oil: Mix a few drops of clove oil with olive oil then apply to wart, change daily. 3. Vitamin E Oil: Rub into wart then cover with a band-aid, do this three times a day. 4. Vitamin A Oil: Rub into wart then cover with a band-aid, do this three times a day. 5. Garlic Capsule Oil: Rub into wart then cover with a band-aid, do this once in the morning and cover with a band-aid. 6. Castor Oil: Rub Castor Oil into the wart a couple times each day until wart is gone, cover with a band-aid. You can also mix baking powder or baking soda and castor oil into a paste and apply to wart, cover with a bandage. Change daily. 7. Grapefruit Seed Extract: Apply a few drops to the pad of a band-aid then cover wart, change daily. 8. Oil of Oregano: Mix a few drops with olive oil then apply to the pad of a band-aid–cover wart and change daily. 9. Lavender Essential Oil: Carefully dab the wart with a drop of Lavender EO, cover with a band-aid. Do this once a day. 10. Geranium Essential Oil: Mix a few drops with olive oil then apply to the pad of a band-aid–cover wart and change daily. 11. Lemon Essential Oil: Mix a few drops with olive oil then apply to the pad of a band-aid–cover wart and change daily. 12. Tea Tree Oil: (also known as Melaleuca Oil) Dab the wart two times a day with tea tree oil until wart disappears. Cover with a band-aid during the day, remove band-aid at bedtime. 13. Frankincense: Apply a drop directly to the wart and cover with tape or a band-aid. Change band-aid daily. Reapply drop of Frankincense twice a week. 14. Vegetable Oil: Smother the wart with a thick coat of vegetable oil then apply tape or a bandage. Do this each night before bed and first thing in the morning. 1. Dandelions: Apply dandelion milk from the stem of a dandelion to the wart. Cover with tape or a band-aid. Apply two times a day until wart is removed. 2. Aloe Vera: Apply the gel from an aloe vera plant to the wart then top with a cotton ball and band-aid. Change twice a day until wart is gone. 3. Basil Leaves: Crush fresh basil leaves and cover the wart, then secure in place with a band-aid. 4. Marigolds: Break open marigold leaves and apply the plant juice directly to wart. Do this daily until wart is gone. 5. Milkweed: A Native American wart remedy is to rub the milk from a milkweed plant into the wart several times a day until wart has been removed. Soaking the warts daily in treated baths will help soften them and help the warts respond to treatment. Can also help fight the virus and prevent infection. Soaking treatments are also worthwhile doing before sloughing the skin with an emery board or pumice stone. Soak wart daily in a warm bath of baking soda and water. 1. Soak wart daily in a hot bath of Epsom salt and water. 2. 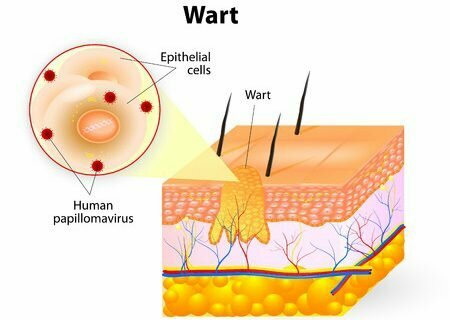 Soak wart in very hot water until it becomes lukewarm (do this daily, don’t have the water so hot it burns you though). Plain hot water is fine but you can also add some vinegar. Beef up your immunity system so your body can fight the wart virus internally. Here are a few suggested immunity boosters I have on hand that are recommended for fighting warts. 1. Cabbage: Eat a lot of fresh, raw cabbage each day. 2. Garlic: Add fresh, chopped garlic to your food whenever possible. You can also take garlic pills or capsules daily. 3. Limes: Squeeze fresh lime juice over food or add fresh lime juice to a glass of water and drink this twice a day. 4. Broccoli: Eat fresh, raw broccoli daily. 5. Oranges: Eat an orange once a day. 6. Bananas: Good for potassium, eat one a day to fight warts. 7. Onions: Top everything suitable with chopped fresh onion, preferably raw but cooked is fine too. This information is simply a collection of home remedies for getting rid of warts – not professional medical advice. Please seek a doctor’s opinion when unsure or to confirm appropriate treatment for your wart.